Saturday at the Mothman Festival was family day for me! Aaron and I took our son Luke for a day of Mothy fun. Luke, who turned six on the Monday following the festival (happy birthday, my boy! ), has been to just about every Mothman Festival since he was born and loves it. He always calls Pt. 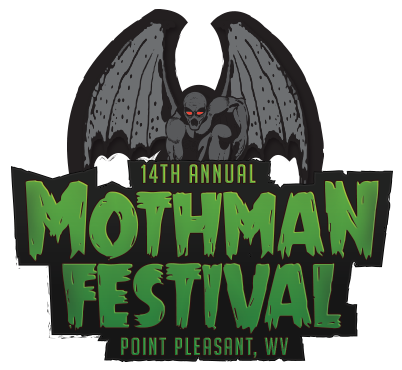 Pleasant "Mothman City" and this year, he was really looking forward to having a Mothman Hotdog from Hillbilly Hotdogs. It was a warm, sunny day when we arrived about 10:45 am and after a stressful drive around trying to find a parking spot, settled in and immediately went to the food trucks, lol. Unfortunately, Hillbilly Hotdogs must have just been opening up because we got in the fairly long line...which didn't move for at all in 15 minutes. So, we decided to just grab some standard fair fare and go down to the riverfront to eat and catch a little bit of the Mothman Pageant activities. Before settling in, Aaron stopped to get a huge mug of old fashioned soda from Wild Bill's Olde Fashioned Soda Pop Co. For $10, he got a huge collector's mug and a voucher for FREE refills all day long! As we found our seats, we noticed that there was something going on to our left, not far from the stage and where the pageant judges were set up. There were a LOT of people milling about and a police boat in the river. An ambulance had its lights on and was standing by. Since the pageant kept going on, we really didn't pay too much attention to what was going on. Finishing up our lunch of corn dogs and cheese fries, we then went to do the vendor circuit. Luke wanted to play some carnival games and won a few prizes and I picked up a few vintage books for less than $2! Luke and Aaron both found some treasures, as well. We checked out everything, and I was really impressed with the variety of art, books, jewelry and other items being sold, plus the array of paranormal speakers and researchers present. One of my absolute favorite booths was the PlushyBoo vendor. 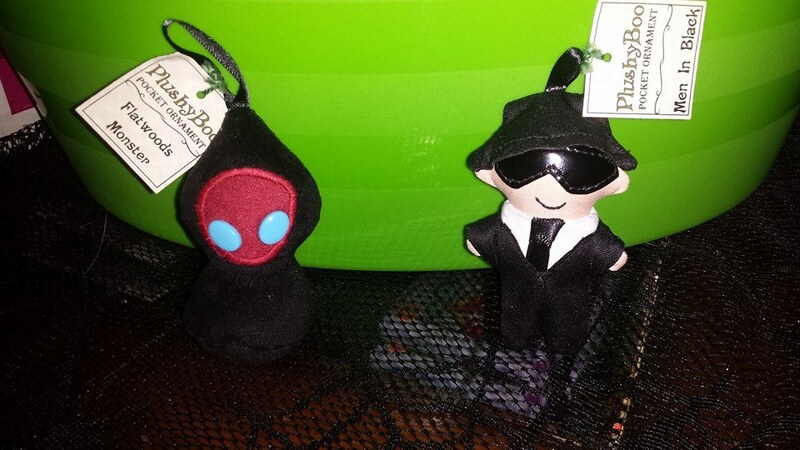 Jen, of PlushyBoo, was selling the coolest and cutest plush cryptid/paranormal themed figures in a variety of sizes. I really should have bought one of the three different Mothman styles she had, because by the time we came back on Sunday, they were all gone...but more on that in Sunday's blog, lol. But, if you were like me and missed her, she has an Etsy shop, too, where everything is 20% off this month! Vowing to come back in a little while to make my final purchasing decisions, we decided to drop what we had already accumulated off at the car. On the way back toward downtown, Luke convinced us that he needed to take a horse-drawn wagon ride! 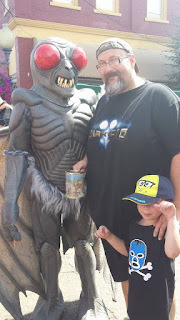 After that devastating news, we looked around some more, got our picture taken with Mothman, who happened to come up RIGHT beside Luke, checked out the Ghost Busters and bought Luke a Daphne pin from the Mystery Machine guy. Then we decided to check out the Navy Poster Museum. Aaron had been there last year, but I didn't go in, so I was in for quite a treat. 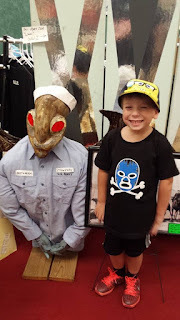 Located where the old Mothman Museum used to be, the Navy Poster Museum is a huge collection covering a huge chunk of time in Naval history. The lady who runs the museum is also very nice and you could tell how passionate she is about sharing that passion with others. Even Luke really enjoyed it---especially the pin-up girl posters and the puzzle that was thoughtfully laid out on a table with chairs. If you're in the Pt. Pleasant area, definitely make this a stop on your trip and go give 'em a LIKE on Facebook, too! Immediately following our trip to the museum, we made our way down to the State Theater to hear Rosemary Ellen Guiley's talk on Spiritualism during the Civil War era. We were a bit early, so we caught the end of Susan Sheppard's Indrid Cold presentation. I'm sorry we missed the beginning, as it seemed like an excellent talk, but luckily, it was recorded and can now be found on YouTube! Anyway, I was really excited to see Rosemary this year. We are generally so busy with other things (and having an impatient child along doesn't help) that we rarely get to sit through the speakers. As predicted I really enjoyed Rosemary's presentation. I have to say, if you get the chance to see ANY of the Mothman speakers, definitely take advantage of it! There is no other place that I know of where you can see the caliber of speakers the festival brings in...and for FREE. And, even though the festival sets record numbers of visitors each year, there's still a real family reunion type atmosphere. You have the chance to get up and personal with the special guests and speakers and have a conversation with them, ask them questions, and if you'd like, buy any books/merchandise they're selling. It's just a really great experience. But, that was the end of our experience for Saturday. By that time, we were all tired and hot and Aaron and I had some birthday party stuff we needed to attend to while Luke spent the night at my mom's, so we concluded our trip. I wasn't disappointed though....because I'd be back the next day!